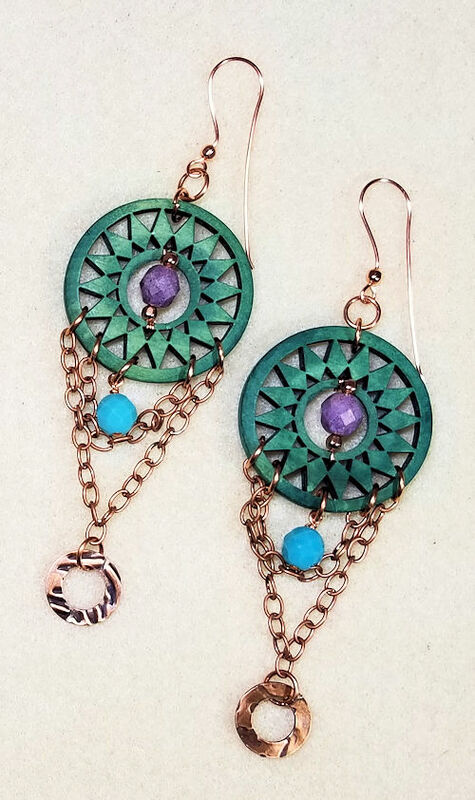 How to Make Statement Earrings? Watch the video – it’s easier than you might think! Statement Earrings with beads are big these days – literally and figuratively! And as to how to make statement earrings? They are easier to make than you think – and you may have all the supplies you need right in your jewelry-making stash! These earrings are suitable for beginning and experienced beaders alike; the most important supply is a sense of adventure! When I go to Joann or Michael’s for some other kind of supplies, I tend to stop by the jewelry aisle and see if there is anything that catches my eye. It might be some color combo that appeals to me, or maybe a shape that tickles my fancy. I rarely have a specific idea when I put them in my cart, but they go into my “bead stash” for future use. The video below shows an example of what you can do with some beads you have hanging around, pleading to be used. You don’t need these exact beads; you probably have something rather similar (or can find something along these lines at Joann, Michael’s Hobby Lobby or even Amazon). One dose of a sense of adventure! You might not need all of the above, depending on where your idea takes you. If you noticed, I didn’t specify the number of round beads, headpins or jump rings — and I only gave you a place to start with the amount of chain you might need. That’s because depending on what’s in your stash, you might need more or fewer of these. Here’s a video of a set of statement earrings that I made; I hope you enjoy it, and that it inspires some ideas for you.